Using Buffer in the Classroom to Teach Students Social Media Scheduling. These days, there is a lot of talk about the importance of scheduling posts to social media (Dan Zarella thinks of it as a ‘science). Posting content to social media at the right time can make all the difference as to how much engagement you garner via likes, clicks, retweets, comments, etc. That’s why it is important that as social media educators we teach our students about optimizing scheduling social media posts and monitoring the success of our posts help us determine when the best times to share are. Enter the new app that’s getting a lot of buzz: Bufferapp – a simple way to automate scheduling posts to be shared on social media (More about the Buffer social media post scheduler). No more posting too much all at once. No more thinking about when to post something. Students schedule content they’ve created as part of a campaign (e.g., original Tweets, Tweets sharing their blog posts, etc). using Hootsuite. Students use Buffer as a compliment to Hootsuite – setting up their Buffer to post ONLY at those times that they are not posting their original content via Hoostuie. That way, when they find relevant and timely content to share, they can add it to their Buffer. If there’s no content, nothing is posted. This combination will result in a more complete sharing schedule strategy that doesn’t overlap. Original written and planned scheduled post – via Hoostuite. “Found” content – via Buffer. I had mixed feelings about Buffer at first. It honestly seemed like a lazy person’s tool to me (I’d previously taught my students to schedule their posts via Hootsuite). Buffer’s appeal is its simplicity. You post something you want to share to Buffer, and it schedules it to be published on your social media account at a given time (currently supports: Twitter, LinkedIn and Facebook. I’ve connected to my Twitter @mjkushin & my LinkedIn profile). There is an app, a browser plugin, and integration into your social media accounts. So it is easy to add content from around the web to your Buffer. You can also manually enter Tweets. When I dug into Buffer, I found the user sets up what day(s) of the week and what time Buffer publishes content. You can also change your settings by day of the week (you have to pay for this feature unfortunately). Once your schedule is set up, all you have to do is add content and Buffer will publish it at your programmed days/times until your Buffer is empty (screen shot of empty buffer rom my Android app). In theory, once you determine your optimized schedule, you can program Buffer for those times. You can always adjust the schedule later of course based on analytics feedback (below). There is an integrated URL shortener with analytics, a la Bit.ly. As you can see (photo above of web app, photo below is same thing on my Android) , it tracks some basic stats for me: retweets, mentions, potential reach (my # of followers here), favorites, and clicks. Not quite as robust at Bit.ly, but good. You can also attach photos. Can be used to schedule posts, once schedule has been determined. Can be used to monitor success of scheduling, to refine posting schedule. A lack of in-depth analytics. 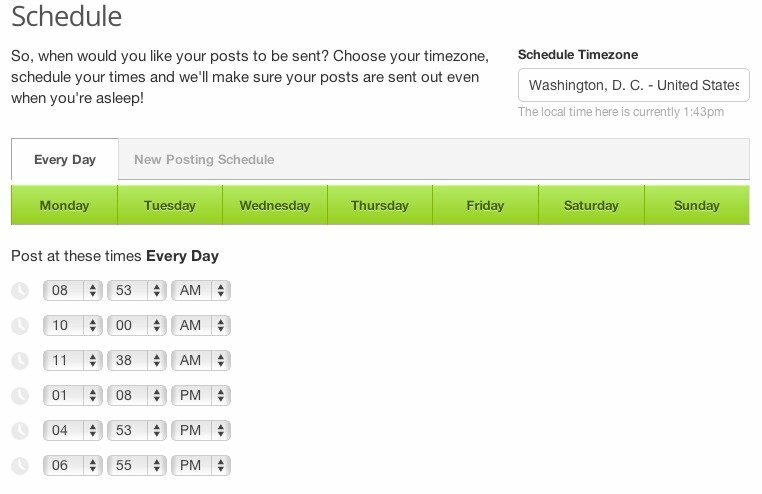 Minimal customization on posting schedule – you can’t adjust the days with free account. I want my students to not only understand the importance of scheduling, but to understand how to determine the best times to schedule through pre-campaign research, and monitoring. Buffer may be a great supplemental tool as part of a larger social media scheduling program and lesson. I’ll keep it in my thoughts and report back if I end up using it in the future. Have you tried Buffer for yourself, in the classroom? What are your thoughts and experiences? Have you taught social media scheduling? How? Please comment below.